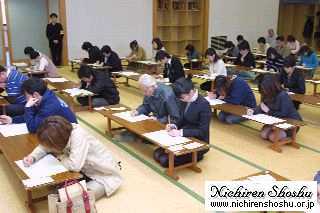 Kangyo is held each year, from January 20th to February 2nd, for the intensive training of the student priests' voices. Each evening at 6:00 p.m. they gather to recite the Sutra with all of the windows open; letting in the harsh cold. Kangyo always falls on the Daikan, which is the coldest two weeks of the year in Japan. 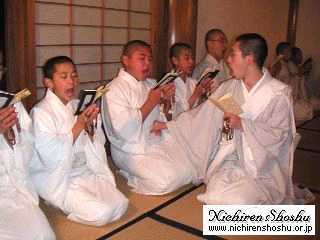 Through reciting the Sutra under these severe conditions, the young priests can develop the strength and clarity of their voices.